I used to get embarrassed every time I allowed someone to edit one of my manuscripts. I'd feel so stupid when they'd mark obvious things. I think to myself, "Wow, I can't believe I missed THAT. They must wonder if my seven year old daughter wrote it." I felt even worse when I'd get macro-edits back from my publisher, the pages of big-picture notes that delineate all the many flaws in plot and character development. In fact, every time I'd get those notes from my editor, I'd say something like, "I'm a terrible writer. I can't believe my publisher ever signed me since I obviously can't write a decent story." The truth is most of us feel a lot of shame when we get feedback on our manuscripts. The negative messages start playing through our minds at top speed. We begin to second-guess our abilities, wonder why readers and publishers would be willing to take a chance on us, and may even feel like giving up all together. Slowly, I'm learning that such shame is unwarranted. No matter our skill level, no matter how many years we've been writing, no matter how many books we have under our belts, all writers need help with editing and usually lots of it. Let me say it again. ALL writers need help with editing. No one is exempt. Not even experienced, bestselling authors. Every writer needs outside assistance in making a book worthy for readers. There's no shame in admitting we make mistakes. It's natural and normal for our books to have flaws, sometimes many. 1. No writer can get a story perfect the first time. No matter how slowly and carefully I write, no matter how much research I do before I start, I still cannot put out a perfect story. Just this past weekend I finished writing my thirteenth full length novel. And even though I think the first draft of this latest novel is fairly clean, I know I'll have plenty of editing to do once I get outside feedback on it. I already have notes in the margin for all the changes I need to make, but objective eyes will always find more ways to make the story better. My point is, that even after completing twelve previous novels, I still haven't written a book that's worthy of publication in first draft format. It's unrealistic to think that all the words of a full length novel (usually somewhere between 60,000 to 100,000) will fit together in absolute union, that dozens of characters, themes, and plot threads will weave together without any bumps or loose threads. 2. Writers can't see their story the way the audience does. Lately as I write, I've been comparing myself to a puppet-master directing a play behind the scenes. I'm dangling all my characters on the stage, trying to keep them acting as they should without getting tangled. I'm paying attention to the background, the transitions, and the one-thousand-and-one other details that need to happen in the story. The fact is, from my position, I just can't view the story with the same kind of objectivity and perspective that those sitting in the audience can. I'm too enmeshed in every nuance to be able to let go and see it with the freshness that can give me the critical feedback on whether everything's working together from start to finish as it should. 3. Writers need to love the vision they have for their stories and not the words. I saw the above image on Pinterest and it really resonated. When I got my rewrites on my first published book, and I realized just how many changes my publisher wanted me to make, I was flabbergasted. I couldn't keep from wondering why they'd given me a contract when there were so many things wrong with my story. Since then, I've realized that agents, editors, and other writing professionals, aren't signing writers who have perfect stories. Far from it. Of course they're able to spot writers who have honed the craft, know how to tell a good story, and can put it all together. But in addition to that, they can see the vision of the story's potential. 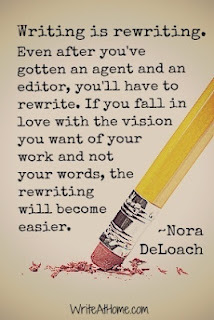 And a good editor will help impart that vision to the author. An author must hold the heart of the story in her hand, but be willing to let the words slip through her fingers. My Summary: If I ever reach a point where an editor tells me I've produced a perfect first draft, then I know I need to solicit further feedback (or a new editor!). Because there's no such thing as a book not needing editing. What about you? Have you ever felt like a terrible writer after getting feedback? How hard or easy is for you to be in love with the vision of the story but not with the words? I'm too early in my writing to get "professional" feedback but I did reach a point where I felt stuck. I knew my writing had flaws, I didn't love what I'd written, but I couldn't put my finger on the changes I needed to make. So I asked my sister to read my most recently completed draft. I know, I know, you aren't supposed to ask family but I asked her for a specific reason - I knew she would be critical and that's what I needed. I needed honest feedback, not someone just telling me "it's great" and "you should get it published." So she read it and honest feedback is what I got. After a few days of depression and telling myself I stink at writing and why did I ever think I could do this? I realized the feedback was just what I needed and was able to improve my story by miles. Something so simple as pointing out I needed to vary sentence structure. Why couldn't I see that? We are too close to our stories and NEED that outside opinion. Thanks for sharing your experience, Shelly! It took courage for your sister to give you honest feedback. I know most of us have a hard time giving completely honest feedback for fear of hurting feelings! But that honesty is exactly what we need to improve! Great post, Jody! It's embarrassing, at my writers' circle, when someone points out a silly mistake I've made. I can use the excuse that I'm slightly dyslexic up to a point, but the reality is, editing one's own work is nearly impossible. We're too close to the work. About ten years ago, when I was a freelance editor, I took over running a members' anthology for The Canadian Authors Association. After all the stories had been selected and edited and arranged in a pleasing order (all by me) the manuscript was sent off to the publisher. When I received it back with tags on almost every page I was horrified, but the editor merely smiled and said: "Not too many changes." So if that's what a decent manuscript looks like, I shudder to think what a manuscript that needs a multitude of changes looks like. Jody, Yes, indeed. When I get feedback, editing, critique advice, call it what you will, I feel embarrassed (that's right after I get over pouting). You're right, of course. No writer produces a perfect manuscript without input from others. Unfortunately, it takes a long time for a writer to learn that. I'll let you know when I finally do. I'm reading ART AND FEAR right now. Have you read it? Very similar sentiment. I haven't read it, Caroline. I'll have to take a look at it! This is just what I needed today, Jody. I always expect perfection from myself, and writing novels is hard...and I'm soooo far from perfect! Love what you said about NEEDING an outside perspective. We aren't weak for needing it. It just is what it is. The first few times I sent a story out for beta reading, I cringed my way through the notes. Especially since I had sent it to readers who were kind but ruthless! I've gotten better about accepting it, though - as you say, I've learned that they aren't sitting there thinking "oh my goodness, what an idiot" any more than I think that about them when I'm critiquing their works. It's all a matter of perspective! You're right about the amount of work. That's why I don't understand when writers put their work out there for free or for 99 cents. If the writer doesn't value their work how can we expect readers to? That's a really tough question, Cynthia. On the one hand I understand where you're coming from. After we spend weeks and months on a manuscript, it does seem to devalue our work if we put it out there so cheaply. But on the other hand, I've seen this technique work as a hook for authors who have been able to publish series, particularly fairly close together. Readers purchase the first book priced low (are willing to take a chance on the new author). And then go on to purchase the rest of the books in the series (which are priced higher). I know!! :-) It's hard to believe!! And I have to say, after finishing this last manuscript, the thrill of completing a book was still as high as always! That joy in bringing a story to a satisfying completion never gets old! I love that analogy, the writer-as-puppetmaster. We can't see our own performance. I open new edits with trepidation. I'm glad to say that the requests sent back on my second book have been a lot easier to handle than the ones that came back on my first. I've often spoken about how the first thing I had to do was remove my first book's initial 50 pages. And for the second, before the submissions editor would even consider offering me a contract I had to do a complete re-write. I guess those two trials by fire have hardened me somewhat. I got over the shame of needing edits because I have twice been thrown into the deep end on them. Would it be alright if I quote your words on a blog post I'm writing and link back to your blog? My favorite line: "It's the author's job to hold the heart of the story in her hand, but to be willing to let the words slip through her fingers." I find this so comforting, Jody. I just read through a first draft, and you know how those are. Oy! But I keep reminding myself that this is only the beginning. It'll only get better from here. Holy cow, I needed to hear this. I just got feedback from my agent, and every negative thought you mentioned went through my head between yesterday and today. We all need help, and there's no shame in that. Thank you! "It's the author's job to hold the heart of the story in her hand, but to be willing to let the words slip through her fingers." Jody, I think the reason why, including ME, get so hard on ourselves about feedback is simply the fact that it's getting harder to keep up with all the changes and "choices" out there now, even if you can't afford certain alternatives (Professionally self-publishing, for instance), you're still bound to certain levels of quality. While it's true no one can ever attain perfection, it's also true that my personal "Best" isn't always enough for whomever I'm trying to entice, be it an agent or editor, or the many beta-readers we have for our works in progress. Even if the basics are the same, achieving them isn't always so basic, if that makes any sense. When you're constantly hearing messages from all fronts that "Good enough" isn't enough, regardless where you are in your personal journey, how do you not go through it without being enraged and frustrated at times? It's not just fellow writers who give us this impression, the business aspects of the process frankly don't help easing the angst, either. When you're fighting just to be READ, it's not always easy to "Brush it off." You don't have to be a delusional "perfectionist" to feel this way. I know you not saying that, Jody, I'm just speaking for myself here. Still, while I really get and agree with what you're saying in this post, on some level the words DO matter, and I say that in the most even-handed way possible. Love the vision you have for the story, not the words. That's good, Jody! You make a good point with #2. When someone reads a ms of mine they bring opinions from their perspective as either a reader or another writer. An editor would add a third viewpoint, and none of them are exactly mine as the story's creator. The more eyes, the better, even if it's uncomfortable having them find things I shouldn't have missed. It's good to remember that the book publishing industry is a business and we all have a part to play in giving our product the best chance of success. A. Only people who really care about your work will give you critical and detailed feedback. B. It is not the reader's job to understand, it is my job to communicate. C. The writing that has received the most "brutal" feedback has always turned out to be my best completed work. Good Lord, this was EXACTLY how I felt about my first book and its edits. Guess, it wasn't that bad because I just got an email today that Harlequin is sending me a contract for book two and wants the next few as well. Merciful Muse! I think every author goes through these emotions -- I did. But I've come to realize that publishers seek potential, not perfection. Writing is a completely different process from editing. To say, I write, therefore I should be able to edit is like saying, I can frame a house, therefore I ought to be able to do the electrical wiring too. Both processes contribute to the final product (a house), but they are distinctly different skills. I think part of the confusion arises from writers' conferences in which writers are told by editors/publishers that they must submit an edited, polished manuscript, and from that writers assume their "polished" manuscript is ready-to-publish, when merely it is as good as they as writers can make it. I wrote first draft of my story around 300 pages. And then when I started to edit I saw a release of a new novel that was published some weeks after I had finished my first draft. And the concept of novel is same as that of mine. How the hell that was possible. Now I am confused whether to continue editing or start all over again with a new idea. I don’t feel like leaving the idea. But I am also clueless on this issue. I am a aspiring writer. How the hell that was possible. What I wrote was my original work. Did you know you can shorten your links with AdFly and make money for every visitor to your short urls.